In today’s competitive job market, it is important to have an up-to-date resume to increase your chances of getting an interview. A great way to begin your job search is to give your resume a quick makeover – especially if you haven’t updated your resume in a while. Below are a few simple steps you can take to make sure your resume will stand out in the job market. Think about the requirements for your ideal job. If you are unsure, look online at job listings, or speak to people who work in your industry. Based on this information, include keywords in your resume that reference the job requirements, including your skills, credentials, and previous employers. Most companies use recruiting management software to screen candidates for job openings, so including keywords is a great way to help you make it through the first round of screenings. Typically, you do not need to include more than your last 10 to 15 years of work experience on your resume. Go through your resume and remove any information that is from more than a decade or so ago. Similarly, if you graduated college more than a few years ago, you do not need to include the years that you attended school. The same holds true for military experience. You do not need to advertise your age on your resume. This step is especially important if you have not updated your resume in a while. Be sure to add any new professional information: a new job, new educational information, new skills. Think outside the box, especially if you feel that your resume is a bit sparse: have you performed any volunteer work recently that relates to your dream job? Even if you have not gotten a new job, perhaps you received a promotion or were given new responsibilities. You can also add professional activities, such as conferences, certificate programs, etc. 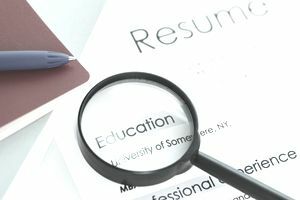 If you have a resume objective (or even if you do not), consider replacing it with a resume profile. A resume profile is a brief summary of your skills, experiences, and achievements as they relate to the job for which you are applying. A resume profile is a great way to show an employer what you can do for them, rather than what you want. When possible, include numbers to demonstrate the actual value of your achievements (for example, “reduced recruitment budget by 10% by implementing innovative and cost-effective online hiring tools”). This will demonstrate not only that you can complete a given task, but also that you can do it well. Be sure to read through your resume to check for any spelling or grammar errors, and to make sure your format is consistent (for example, if you bold one employer’s name, you need to bold every employer’s name). Have a friend or career counselor check over your resume as well. If you have posted your old resume to any job boards, be sure to replace it with your new resume. It is especially important that you update the “Background” section of your LinkedIn profile to match your new resume. Prospective employers will be wary of any discrepancies between your resume and your online profiles. It is worth the time to update your resume regularly. Whenever you get a new job, achieve something at work, or begin a continuing education course, be sure to add it to your resume. It’s much easier to continually update your resume than to start from scratch every few years.